view detail 주차 안내 리 가든스 주차장 안내 view detail Valet Parking Service Simply drive up to the valet parking counter located at Hysan Avenue on every Friday to Sunday and Public Holiday, our parking attendants will be at your service. 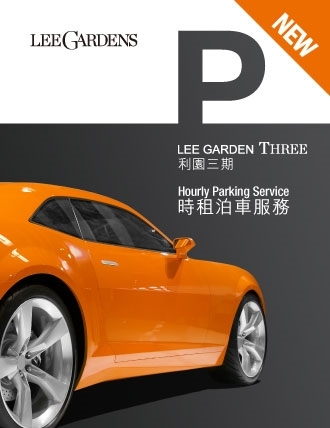 view detail Hourly Parking Service is now available in Lee Garden Three! The standard rate is HK$16/half an hour. view detail Electric Vehicle Charging Services at Lee Gardens Area EV charging services launched for electric car owners at Lee Garden Area to promote Green living by reducing carbon emissions. view detail 최대 3시간 무료 주차 최대 3시간 무료 주차 - 레이톤 센터 주차장, 서닝 플라자 주차장, 리 가든스 주차장. 이용 약관이 적용됩니다. view detail Tesla Supercharger Spaces (Lee Garden One) Two Tesla Superchargers are in service on the B3 Floor of Lee Garden One Car Park. view detail Dine and Park Privileges Spend designated amount with F&B spending at Lee Gardens Area on designated days to receive an additional 1-hour free parking coupon! When you spend HK$3,000 or above via electronic payment (on a maximum of two same-day receipts with matching electronic payment sales slips) in the Lee Gardens Area, you can receive a Lee Gardens Area Limited-Edition OCTOPUS *. * All gifts are available on a first-come-first-served basis while stock lasts and redemptions may be terminated without prior notice. Terms and conditions apply. The promotion period until 31st Aug 2019. 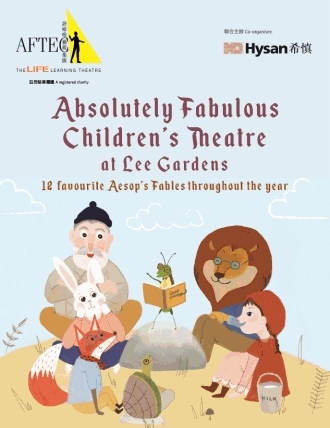 Tourists can enjoy offers at designated Lee Gardens Area stores by presenting an electronic or print copy of the 【A Fabulous Day at Lee Gardens】 Tourist Booklet. Please click here for merchant list and details. 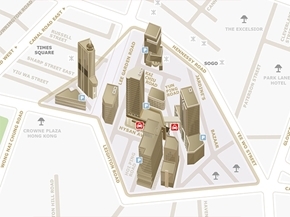 Redemption Location: Concierge at G/F of Lee Garden One & Concierge at 1/F of Hysan Place. Each overseas tourist with valid travel documents (required to verify their identity) may redeem one tourist booklet once only. 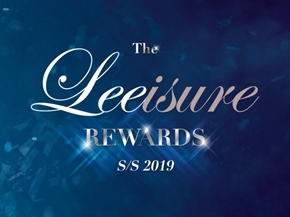 Exclusive privileges at Lee Gardens—redeeming a limited edition Lee Gardens Area Octopus is valid until 31 August, 2019. Merchant offers are valid until 31 August, 2019 (except offers with specially listed promotion periods). Terms and conditions from merchants apply to each offer. Please refer to merchants for details. Offers cannot be exchanged or redeemed for cash. All gifts are limited and available on a first-come-first-served basis while stock lasts, and redemptions may be terminated without prior notice. Participating merchants are solely responsible for all offers and products. Hysan Marketing Services Limited (Hysan) is not the provider of any of these products and/or services herein and makes no representation or warranty in relation to the same. Hysan Marketing Services Limited is not the manufacturer/supplier of the gifts and will not give any warranty, representation or guarantee and has no liability whatsoever in respect of any of the gifts. The customer has the right to request access to his/her personal data held by Hysan and to request a correction of any personal data that is incorrect. Hysan has the right to charge a reasonable fee for processing and complying with a data access request. Requests for access or correction of a customer’s personal data, or enquiries about the policies and practices of Hysan in relation to personal data should be made in writing to data.officer@hysan.com.hk. In case of any conflict or inconsistency between the English and the Chinese versions of these Terms & Conditions, the English version prevails. The promotion period is from 29 September 2018 to 31 August 2019, both dates inclusive. Up to a maximum of 2 original same-day electronic receipts (total amount at HK$3,000) and the corresponding electronic receipts and matching payment sales slips issued by participating shops at Lee Garden One, Lee Garden Two, Lee Garden Three, Lee Garden Five, Lee Garden Six, 25 Lan Fong Road, Hysan Place, Lee Theatre, Leighton or One Hysan Avenue (I.T HYSAN ONE) per shopper per day must be presented in person at the designated counters on the same day as the purchase (save and except where the relevant sales transaction takes place after 10:15pm on the day, entitling the shopper to redeem the gift on the next day) to entitle the shopper to redeem a limited edition Lee Gardens Area Octopus (gift). 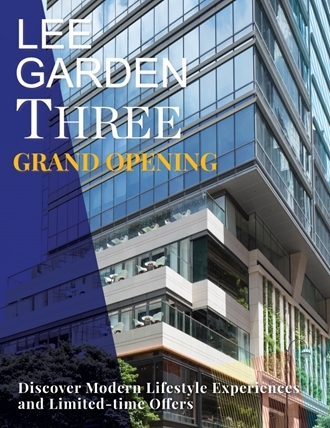 The designated counters are the concierges located at G/F of Lee Garden One and 1/F of Hysan Place, which are all open daily between 11:00am-10:30pm. Only redemption on the day of spending is accepted. This gift redemption is valid only for electronic payments by credit card, debit card, UnionPay card, EPS, credit card cash dollar, Alipay, Apple Pay, Android Pay, Samsung Pay and Wechat pay. Other modes of payment, including cash, Octopus, cash coupon, and merchant stored-value cards, will NOT be accepted. Hysan Marketing Services Limited reserves the right to request Alipay, Apple Pay, Android Pay, Samsung Pay and WeChat Pay users open the corresponding mobile apps for verification purposes. Cancelled, refunded, forged, fraudulent or unsettled transactions will NOT be accepted. This offer does not apply to utility bill payments, Octopus automatic add-value service amounts and transactions, office tenant transactions, unposted/unauthorised or any transactions without credit card sales slips and merchant sales receipts (such as online purchases, mail/fax/phone orders, internet purchases and charity donations), transactions with merchant vouchers and cash coupons, bank services, telecommunications services, car parks, stored-value cards or any value added to stored-value cards. Handwritten receipts, standalone credit card sales slips, reprinted or photocopied receipts, damaged receipts, deposit receipts (including both partial and full payment), receipts for purchasing or using cash or gift vouchers and coupons, and bill payment receipts will NOT be accepted. Receipts from the Apple Store, Ray-Ban, Van Cleef & Arpels, Law Mark Kee, Workware and Challenger will NOT be accepted. 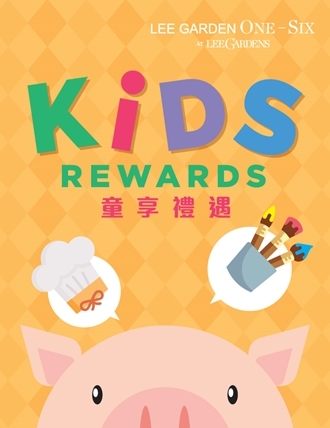 This gift offer can be used in conjunction with the GO GREEN CAUSEWAY BAY promotion, but cannot be used in conjunction with the China Merchant Bank redemption or any other Lee Gardens area promotional activities or offers. Each original machine-printed receipt, with its matching electronic payment sales slip satisfying the required spending amount, can only be used once for gift redemption, and no exchange will be available after redemption. Hysan Marketing Services Limited reserves the right to photocopy the receipt(s) and payment sales slip(s) for verification purposes. All gifts cannot be exchanged or redeemed for cash. The terms and conditions listed on the website shall prevail. 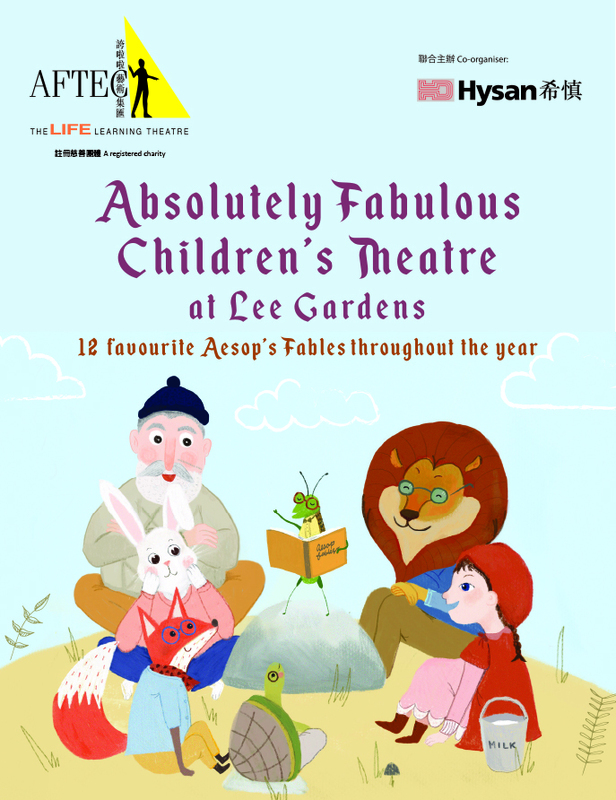 For more details, please visit website at https://www.leegardens.com.hk/. The promotion period lasts from 29 Sept 2018 to 31 Aug 2019, both dates inclusive. 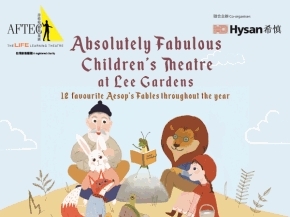 Offers are available at Lee Gardens Area stores on presentation of an electronic or print copy of the 【A Fabulous Day at Lee Gardens】Tourist Booklet. Offer cannot be used in conjunction with other promotional offers. Discounted/ special priced/ fixed price dishes, set menus, special promotional menus, guest chef promotions, coupons, any mileage programmes and membership benefits, will NOT be applicable. (unless otherwise specified). Please check with the selected participating merchants for details . Offer can only be used once per customer while stocks last. The offers are not available on festive days, general holidays and days before the general holidays (unless otherwise specified). Please check with the selected participating merchants for details. All gifts are limited and available on a first-come-first-served basis while stocks last and redemptions may be terminated without prior notice. The merchant reserves the right to amend or withdraw any terms and conditions or terminate this offer at any time. In case of any disputes, the decision of the merchants shall be final. Terms and conditions apply, please visit specific shops for more details. 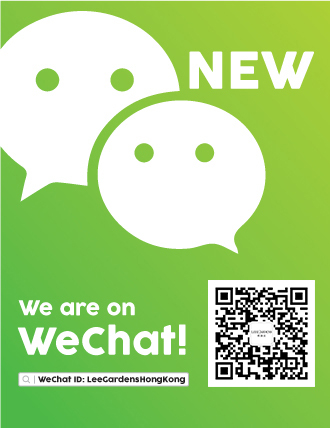 Follow the Lee Gardens Area's NEW official WeChat account for all our latest promotions and events! 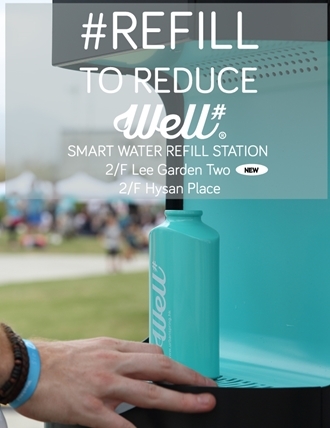 Well井’s smart water refill station at Lee Garden Two: a sleek, interactive experience that delivers clean, quality drinking water. Well井 is designed with real-time usage monitoring and smart sensors to ensure optimal filtration so it delivers the best possible water straight to you. With NSF International-certified ultra-fine filters, this could well be the best tasting water for miles. 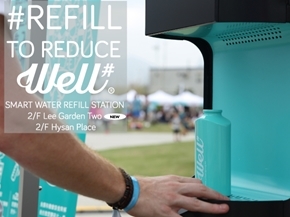 On top of that, by drinking from Well井, you will be part of the movement to cut down on single-use plastic bottles. How can you inspire your kids to be environmentally friendly? What treasures of nature are hidden inside Hysan Place? 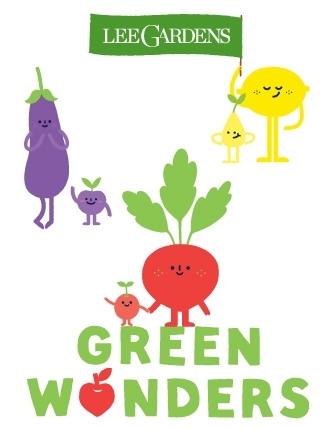 Join our Green Wonders tour and workshop with your kids! Inspire them to love our planet through this fun filled experience. *Free entry. First come first served. Lee Garden Three Grand Opening! # Receipts from Maggie & Rose cannot be used to redeem this offer. 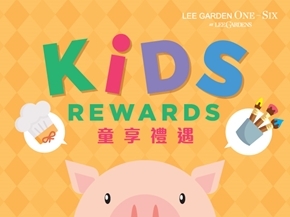 Maggie & Rose Activity Voucher and One-Day Experience Pass can only be used at the Lee Garden Two shop, on Monday to Thursday (excluding public holidays), at 9am–7pm, and are valid only for the one month specified on the voucher/ pass. Each voucher/ pass can be used by one child with his/her parents. Reservations required. 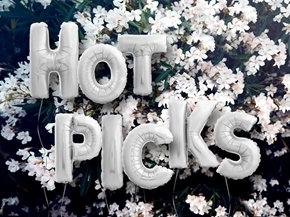 All offers are available on a first-come, first-served basis while stocks last. This offer cannot be redeemed in conjunction with any other Lee Gardens area promotional offers, except free parking redemption. 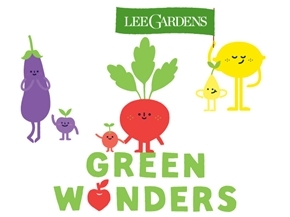 Lee Gardens Area Gift Certificates/ e-Gift Certificates are valid at the designated merchants only. The terms and conditions of the merchant apply. For the full terms and conditions, please refer to the details on certificates. Please check here for the designated merchants list. Receive a HK$20 Lee Gardens e-Gift Certificate^ by spending HK$200 or more* in single purchase with an HSBC Credit Card at designated dining outlets in the Lee Gardens Area, and signing up as a Lee Gardens Plus member via the Lee Gardens Mobile App. *Valid only for same-day single purchase by electronic payment with an original machine-printed receipt and matching HSBC credit card payment sales slip. 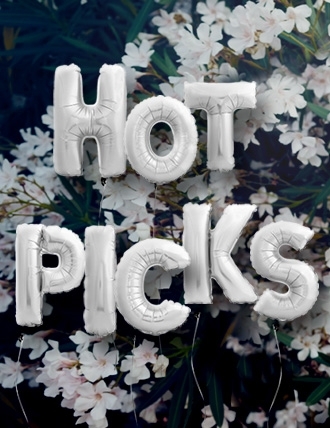 ^Offers are available on a first-come, first-served basis while stocks last, and redemption will be terminated accordingly without prior notice. Promotion Period: 1 April – 14 June, 2019 (unless otherwise specified). The 30% off discount on dining offers is only applicable at selected merchants. Terms and conditions apply. 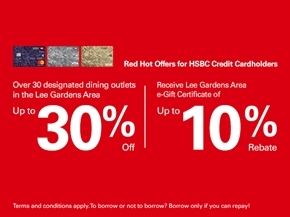 Please contact the designated restaurants’ staff or visit https://www.redhotoffers.hsbc.com.hk/tc/latest-offers/red-hot-dining-special/q2-offers/lee-garden-areas/ for details. Receive a complimentary Plain Dark Truffles Gift Box, 2 pcs upon spending HK$800. A complimentary dessert upon ordering 2 panini. A complimentary dish of Signature Steamed Xiao Long Bao (5pcs) upon spending HK$500. 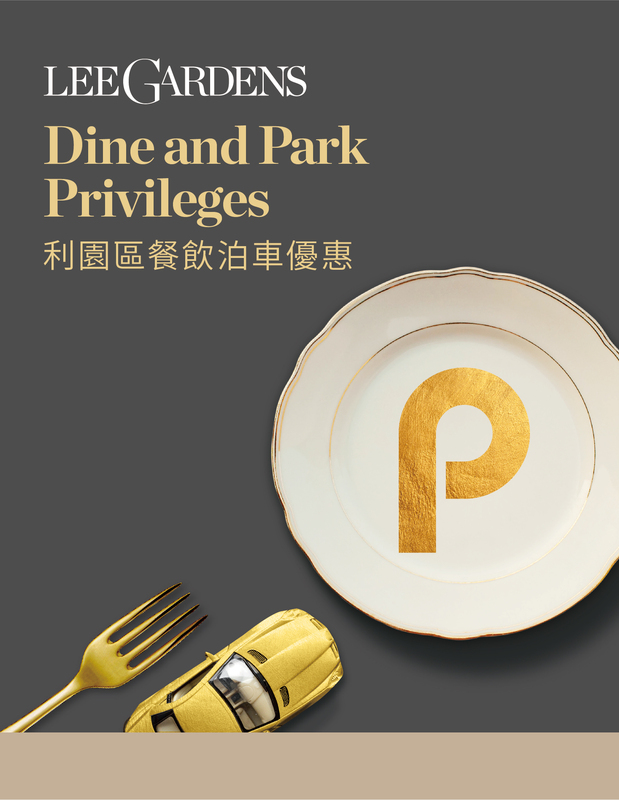 Privilege 1 ― Receive a HK$20 Lee Gardens e-Gift Certificate^ by spending HK$200 or more* in a single purchase with an HSBC Credit Card at designated dining outlets in the Lee Gardens Area, and signing up as a Lee Gardens Plus member via the Lee Gardens Mobile App. The promotion period is from 1 April to 14 June 2019, both dates inclusive. All offers are limited and available on a first come, first served basis while stock lasts, and the redemption will end accordingly without prior notice when stock runs out. The gifts are offered for total of 3750 servings throughout the promotion period. Each original machine-printed receipt, with its matching electronic payment sales slip satisfying the required spending amount, can only be used once for gift redemption, and no exchange will be available afterwards. Hysan Marketing Services Limited reserves the right to photocopy the receipt(s) and payment sales slip(s) for verification purposes. Maximum ONE original same-day electronic receipts and the corresponding matching payment sales slip issued by participating restaurants at Lee Garden One, Lee Garden Two, Lee Garden Three, Lee Garden Six, Hysan Place, Lee Theatre or Leighton per shopper per day must be presented in person at the designated counter on the same day as purchase (except where the relevant sales transaction takes place after 9:45pm on the day, entitling the shopper to redeem the gift coupon on the next day, except the last day of promotion) to entitle the shopper to redeem the gift coupon. The designated counter is the concierge located at G/F of Lee Garden Two which is open daily between 11:00am-10:00pm. Only redemption on the day of spending is accepted. The redemption is valid only for electronic payments by HSBC credit card. Other payment methods, including credit card from other banks, debit card, EPS, RewardCash, Alipay, cash, Octopus card, cash coupon, and merchant stored-value cards, will NOT be accepted. Hysan Marketing Services Limited reserves the right to request that Alipay, Apple Pay, Google Pay, Samsung Pay and WeChat Pay users open the corresponding mobile apps for verification purposes. Cancelled, refunded, forged, fraudulent or unsettled transactions will NOT be accepted. Transaction is not applicable to utility bill payments, Octopus automatic add value service amount and transactions, office tenant transaction, unposted/ unauthorised and any transactions without credit card sales slips and merchant sales receipts such as online purchases, mail/fax/phone orders, internet purchase and charity donations, merchant vouchers and cash coupons, bank services, telecommunications services, car parks, stored-value cards or any value added to stored-value cards. Handwritten receipts, standalone credit card sales slips, reprinted or photocopied receipts, damaged receipts, deposit receipts ( including partial or full paid), receipts for purchasing or using cash or gift vouchers and coupons, bill payment receipts, receipts for any value added to stored-value cards will NOT be accepted. Receipts from Apple Store, Workware, Van Cleef & Arpels, Challenger, Maggie & Rose, Pop-up Store and Pop-up Bazaar will NOT be accepted. Customers must redeem the offer in person. Redemption by shop staff on behalf of customers will not be accepted. The shopping offers cannot be exchanged or redeemed for cash, or other services or products. 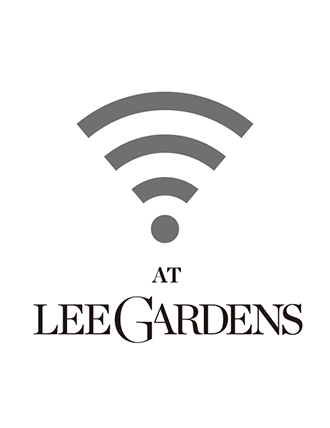 Lee Gardens Area Gift Certificates/ e-Gift Certificates are valid at the designated merchants The terms and conditions of the merchant apply. For the full terms and conditions, please refer to the details on certificates. 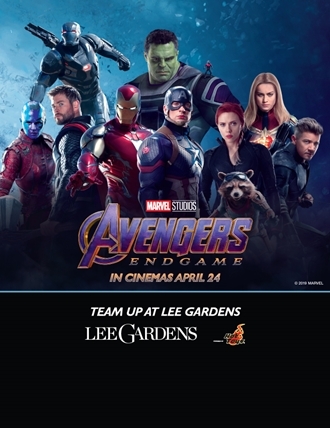 The above redemption cannot be used in conjunction with other Lee Gardens Area promotional offers, except parking promotion. A coupon will be delivered to customers via SMS in the form of e-Gift Certificate. 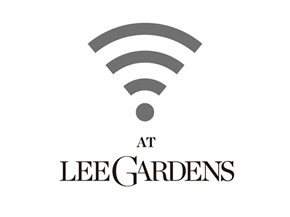 A smartphone (iOS, Android) with Lee Gardens Plus mobile App and internet access is required to access the e-Gift Certificate. Customers shall ensure a correct mobile phone number is provided, otherwise Hysan Marketing Services Limited shall not be responsible for any non-delivery arising therefrom, and the e-Gift Certificate will not be re-issued. 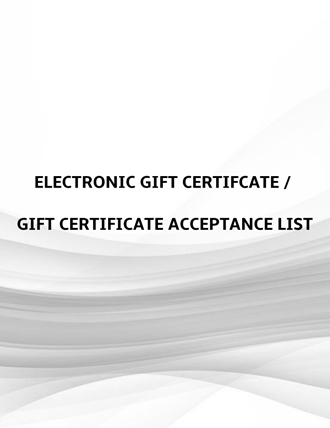 This e-Gift Certificate is valid only with the validation of Hysan Marketing Services Limited. This e-Gift Certificate is valid for one-time use only. 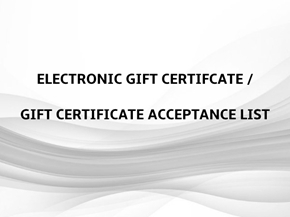 This e-Gift Certificate cannot be altered or exchanged for cash or other certificates of any value. Not change or refund will be given when using the e-Gift Certificate. This e-Gift Certificate will not be replaced if lost, damaged or stole, and Hysan Marketing Services Limited shall not be liable for these incidents. Damaged, scanned or photocopied e-Gift Certificate will not be accepted. Hysan Marketing Services Limited and the respective merchants reserves the right to end or extend the above redemption programme and/or to modify, revise or change any of these terms and conditions at any time without any prior notice and without incurring any liability to any party whatsoever. Hysan reserves the right to make the final decision in case of any dispute. The customer has the right to request access to his/her personal data held by Hysan and to request a correction of any personal data that is incorrect. Hysan has the right to charge a reasonable fee for processing and complying with a data access request. Requests for access or correction of a customer’s personal data, or enquiries about the policies and practices of Hysan in relation to personal data should be made in writing to officer@hysan.com.hk. In case of any conflict or inconsistency between the English and Chinese versions of these terms and conditions, the English version prevails. 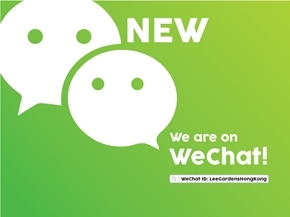 The promotional period is from 1 April 2019 to 14 June 2019, both dates inclusive (unless otherwise specified) (“Promotional Period”). 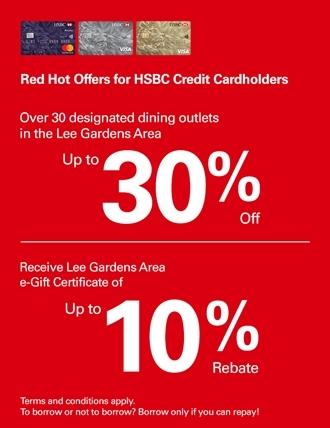 Unless otherwise specified, this promotion applies to customers holding any Hong Kong Dollar personal primary, combined additional, separate additional credit cards or UnionPay Dual Currency credit cards (applicable to Hong Kong Dollar sub-account only) issued by The Hongkong and Shanghai Banking Corporation Limited in Hong Kong (and its successors and assigns) (”HSBC”) (each an “Eligible Credit Card”). Customers holding any Eligible Credit Cards shall be referred to as the “Cardholder(s)” herein below. An Eligible Credit Card must be used for all relevant payments (unless otherwise specified) during the Promotional Period in order for Cardholders to receive any of the applicable offers under this promotion. A Cardholder must be one of the diners and state the redemption of the offer(s) prior to ordering to enjoy the offer(s). Advance reservation may be required for some of the participating merchants. Unless otherwise specified, only one offer/special set menu can be used per table each time. Please check with the respective participating merchants for details. The offers are only applicable to dine-in consumption on food at participating merchants only and are not applicable to take-away food items, beverages, 10% service charge (based on usual retail price), tea and condiments (unless otherwise specified). Please check with the respective participating merchants for details. The offers cannot be exchanged for cash/service, other products or discounts. The offers are not transferable and cannot be used in conjunction with other discounts, promotional offers and discounted items / programmes (unless otherwise specified). Please check with the respective participating merchants for details. The offers are not applicable to discounted / special priced / fixed price dishes, set menus, special promotional menus, guest chef promotions, wine dinners, private functions, banquets, weddings, meetings / conferences, catering services, room service, ticket sales events, coupons, complimentary valet parking, any mileage programmes, membership benefits, cigarettes/cigars, mooncakes, alcoholic beverages, champagnes, wines and liquors, sales merchandise, VIP rooms and private rooms (unless otherwise specified). Please check with the respective participating merchants for details. The offers are not available on festive days, general holidays and days before the general holidays (unless otherwise specified). Please check with the respective participating merchants for details. Product information / descriptions / prices / services / offers / food / beverage / menu descriptions featured in this communication are provided by the respective participating merchants and are for reference only; HSBC shall have no liability in this respect. Cardholders understand and accept that HSBC is not the supplier of such products / services / offers / food / beverage purchased and Cardholders should check with the respective participating merchants for details. HSBC accepts no liability for the quality of products / services / offers / food / beverage provided by the respective participating merchants. The promotion is governed by these terms and conditions and other terms and conditions stipulated by the respective participating merchants. HSBC and the respective participating merchants reserve the right to amend these terms and conditions and other terms and conditions of the offers and to terminate this promotion at any time without any prior notice to Cardholders. HSBC accepts no liability for any such change and termination and will not notify the Cardholders separately of any such change and termination. The promotional food and beverage items are available while stock lasts and subject to availability or change without prior notice. No person other than the Cardholder and HSBC will have any right under the Contracts (Rights of Third Parties) Ordinance to enforce or enjoy the benefit of any of the provisions of these terms and conditions. In case of any disputes arising out of this promotion, the decision of HSBC and / or the respective participating merchants shall be final and conclusive. 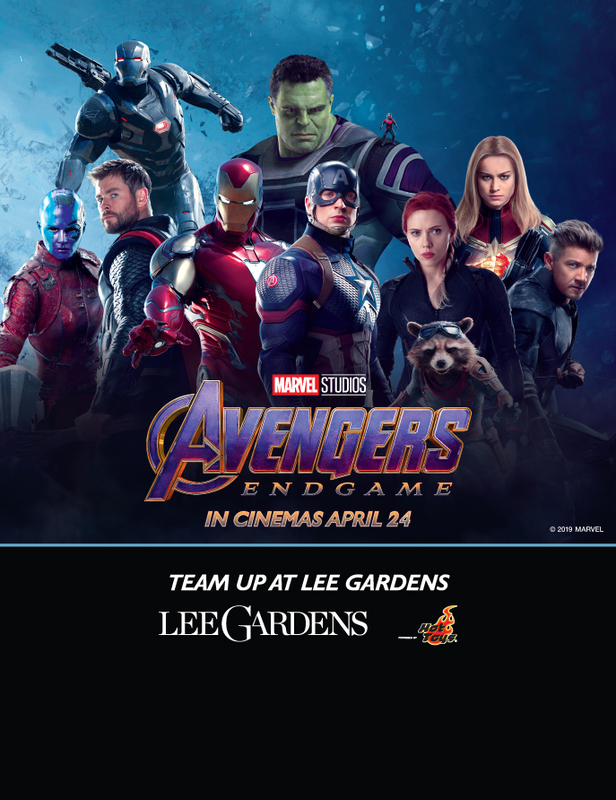 Marvel Studios' Avengers: Endgame comes to Lee Gardens! Spend designated amount by electronic payment at Lee Gardens Area to receive Limited-edition Premiums now! 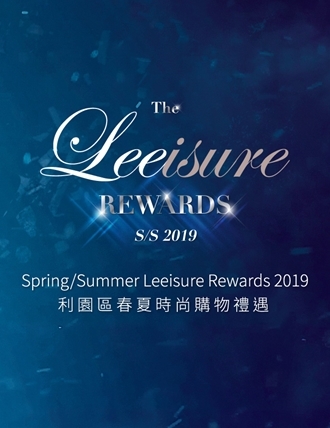 From 26 April 2019 to 13 May 2019, spend a designated amount* by electronic payment in the Lee Gardens area to redeem up to HK$2,200 E0Gift Certificates. Club Avenue members can further enjoy up to 1.8 million bonus points! 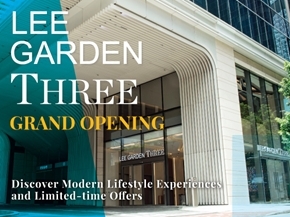 Spend HK$2,000 or above (on a maximum of 2 machine-printed receipts)# at Lee Gardens Area on the same day to enjoy a complimentary valet parking service and 2 hour of free parking. New Limited-time Offer: Spend additional HK$1,000 in one single transaction by electronic payment# for an additional 1 hour of free parking and enjoy up to 6 hours of free valet parking per day^! We would like to have your car ready for you when you leave. Please call our Lee Garden One Concierge at 2907-5227 20 minutes prior to picking up your car. # Present designated number of the same-day original machine-printed electronic payment receipt(s) with required spending amount, its matching sales slip, and valet parking ticket for valet parking privilege redemption. 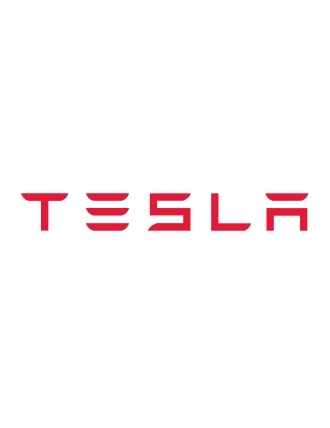 ^ Each person (per vehicle) may enjoy up to 6 hours of free valet parking service each day. 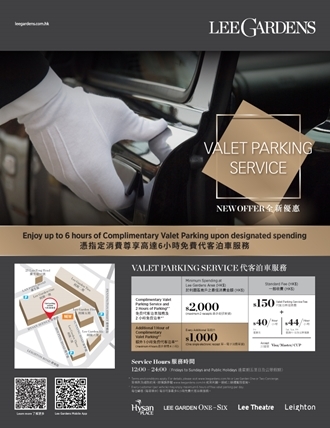 * All cars using valet parking service (“Service”) must be driven to the driveway of 33 Hysan Avenue, Lee Garden One (“Car Drop-off Point”) between 12:00 and 23:00 on Fridays to Sundays and Public Holidays and be picked up on or before 24:00 on the same day to enjoy valet parking service. Service will be suspended when typhoon no.8 (or above) or the Black Rainstorm signal is hoisted or the driveway of Lee Garden One is closed. The Service is subject always to the terms & conditions which shall be deemed to be accepted upon the use of the Service. Please click here for more details. Hourly Parking Service is now available in Lee Garden Three! 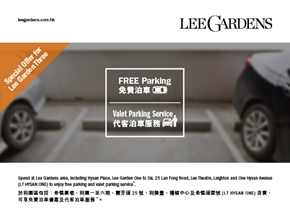 Hourly Parking Service is now available in Lee Garden Three! The standard rate is HK$16/half an hour. 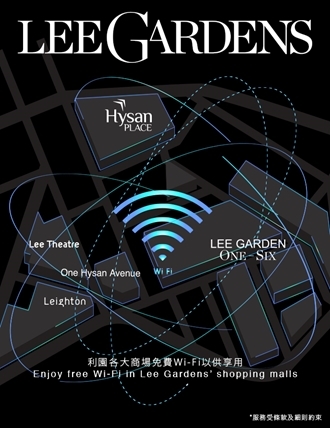 Enjoy free parking by spending a designated amount within the Lee Gardens area (Hysan Place, Lee Garden One to Six, 25 Lan Fong Road, Lee Theatre, Leighton or One Hysan Avenue (I.T HYSAN ONE). #Hysan Leasing Co. Ltd reserves the right to cancel, alter and suspend the offer, and also amend the terms and conditions without prior notice. Present designated number of the same-day original machine-printed purchase receipt(s), and credit card or Octopus card used when entering a carpark, with required spending amount for free parking privilege redemption. Only original machine-printed spending receipts issued by retail shops, restaurants or fitness centres in the above shopping locations i.e. 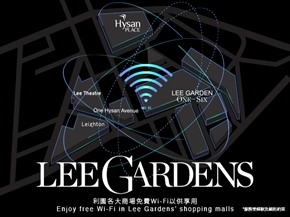 Hysan Place, Lee Garden One to Six, 25 Lan Fong Road, Lee Theatre, Leighton or One Hysan Avenue (I.T HYSAN ONE) are eligible for free parking privilege redemption. Credit card receipts, handwritten receipts, reprinted or photocopied receipts, damaged receipts, pre-order/deposit receipts (including both partial or full payment), receipts for purchasing cash or gift vouchers and coupons, bill payment receipts, any value added to store-value cards, receipts from bank and Challenger will NOT be accepted for free parking and free valet parking redemption. The free parking privileges are calculated based on the actual time the vehicle enters the relevant car park. The customer must redeem the free parking privilege before driving the vehicle through the carpark gate exit. Free parking privilege is only valid for parking of private motor vehicles at Lee Garden One, Lee Garden Two, Lee Garden Three, Leighton and Hysan Place carparks on the day of redemption. 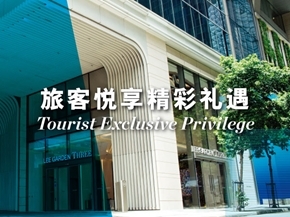 Hysan Leasing Co. Ltd (including its managing agent) may require a customer to supply proof of identity or other items of personal information including but not limited to an individual's name, bank/credit card numbers or Octopus card numbers, for the purpose of processing the free parking privilege and to verify the customer's eligibility or the validity or authenticity of the spending receipts and/or for internal administration and auditing purposes. If the customer refuses to supply the relevant information, Hysan Leasing Co. Ltd is not obliged to process the free parking privileges. Free parking privileges can only be redeemed once per customer per vehicle per day. All free parking redemptions are restricted to shoppers in-person. The free parking privileges cannot be exchanged for cash or set off and cannot be used in conjunction with other car park promotion offers. The free parking privileges are subject to carpark space availability and is not valid for the purpose of loading / unloading. The House Rules, the Terms and Conditions of Use & Rules and Regulations of the relevant carpark shall apply to all parking at the relevant carparks. Hysan Leasing Co. Ltd. reserves the absolute right to change or amend any of the above Terms and Conditions, to change, extend, cancel or withdraw any of the free parking privileges and the promotion period of this offer at any time without prior notice and without incurring liability to any party whatsoever. 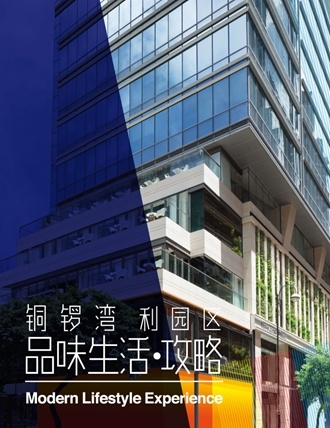 Hysan Leasing Co. Ltd. has the right of final decision in case of dispute. In the case of any conflict or inconsistency between the Chinese and the English versions of this communication material and the above Terms and Conditions, the English version shall prevail. 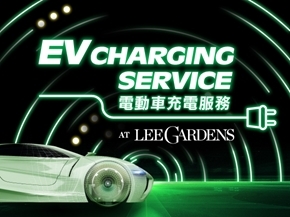 Following the opening of Lee Garden Three, new EV charging points are being integrated into the parking area at Lee Garden Three to keep pace with the speedy development of environmentally friendly electric cars. 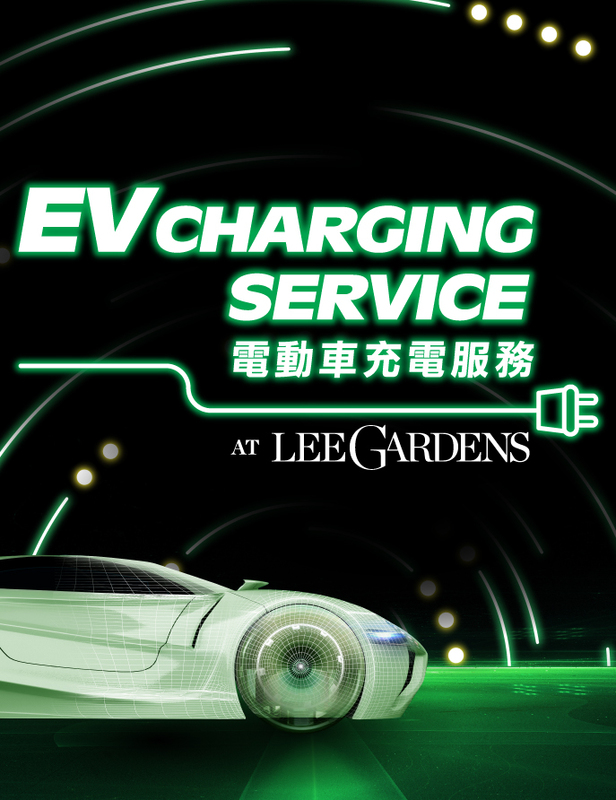 A total of 14 EV chargers are in service in the Lee Gardens Area, making Lee Gardens an even more popular all-round leisure destination for motorists. ** Terms and conditions apply, please click here for more details. #Terms and conditions apply, please click here for more details. 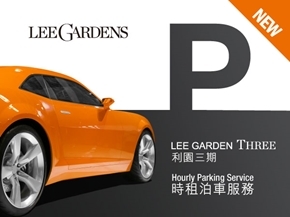 The rate of Lee Garden One Car Park is HK$20/half an hour (Mon-Fri) or HK$22/half an hour (Sat, Sun & Public Holiday). 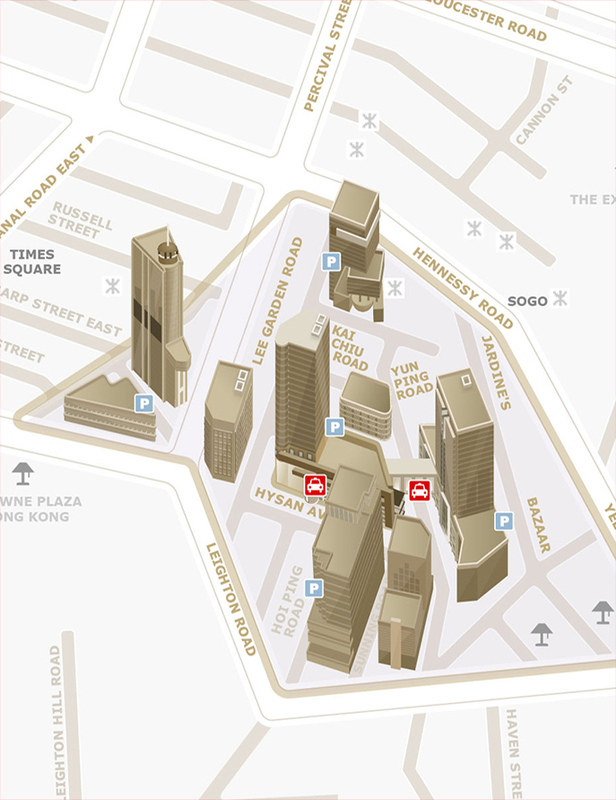 The rate of Lee Garden Two or Lee Garden Three or Hysan Place Car Park is HK$16/half an hour. The rate of Leighton Car Park is HK$12/half an hour. From now until 22 March, follow simple steps to receive a free parking coupon for free! ^please change the referral code to “19FP” manually during registration to receive the free parking coupon. Coupon is valid on Monday to Thursday from 21 Jan 2019 to 31 March 2019 only (excluding Public Holidays). Each coupon can be used once only and cannot be used on the same day of issue. Each person (per vehicle) may use a maximum of 2 free parking coupons each time (excluding Club Avenue members). 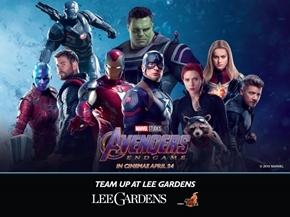 Coupon can be used in conjunction with other Lee Gardens parking privileges, but each shopper may enjoy a maximum of total 6hour free parking per visit per day only. Coupon is not redeemable for cash, not cancellable, not changeable, not exchangeable or transferable for whatever purpose. Coupons are only valid for parking of private motor vehicles at Lee Gardens One to Three and Hysan Place carparks only. The free parking hours are calculated based on the actual time the vehicle enters the relevant car park. Additional hourly parking fee will be charged if parking time exceeds the valid designated free parking hours. Photocopies of free parking coupons will not be accepted. The use of parking coupon is subject to carpark space availability and is not valid for the purpose of loading/unloading. Shoppers must present the parking coupons and have the procedures for free parking processed within the designated time at designated counters, or Hysan Marketing Services Limited reserves the right to reject to process any free parking for shoppers. The House Rules, the Terms and Conditions of Use & Rules and Regulations of the relevant carpark shall apply to all parkings at the relevant carparks. Hysan Marketing Services Limited reserves the absolute right to change or amend any of the above Terms and Conditions, to change, extend, cancel or withdraw any of the Lunar New Year Parking Privileges and the promotion period of this offer any time without prior notice and without incurring liability to any party whatsoever. Hysan Marketing Services Limited has the right of final decision in case of dispute. Upon spending HK$200 (on a maximum of 2 machine-printed receipts) You can enjoy 3 hours (Mon-Fri) / 2 hours (Sat, Sun & Public Holiday) of free parking in Leighton Car Park. #Hysan Marketing Services Ltd reserves the right to cancel, alter and suspend the offer, and also amend the terms and conditions without prior notice. Valet parking service is available to all Lee Gardens shoppers. 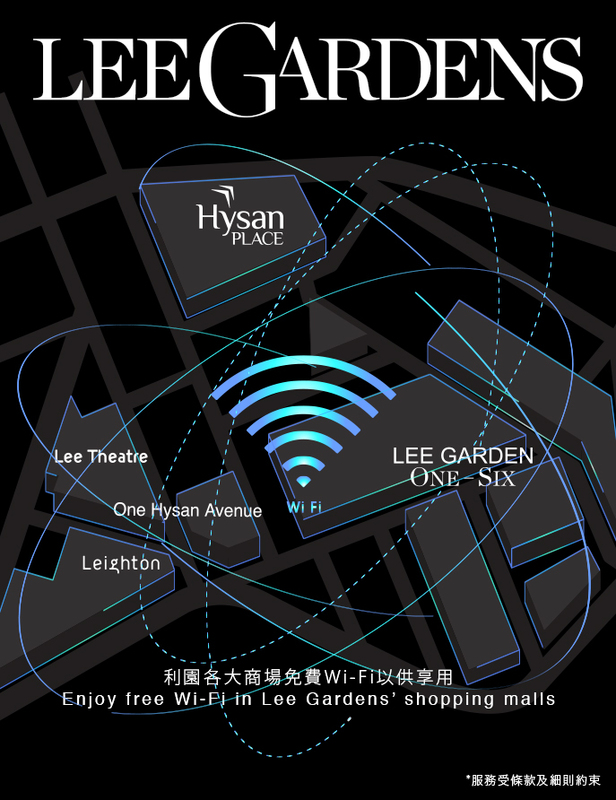 Simply drive to Hysan Avenue (outside the shopping mall entrance of Lee Garden One) and drop your car off with Hysan Parking Valets. After shopping, collect your car from the Parking Valets at the same location. Spend HK$2,000 or above (on a maximum of 3 machine-printed receipts) at Lee Gardens area to enjoy your complimentary valet parking privilege and 2-hour free parking. *Service will be suspended when typhoon no.8 (or above) or the Black Rainstorm signal is in effect or the driveway of Lee Garden One is closed. Present designated number of the same-day original machine-printed purchase receipt(s), and credit card or Octopus card used when entering a carpark or valet parking ticket, with required spending amount for free parking privilege redemption. The customer must redeem the free parking privilege before driving the vehicle through the carpark gate exit or before picking up the valet car. 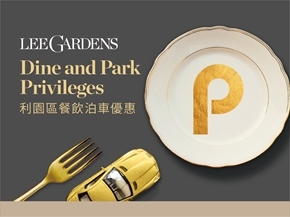 Free parking privilege is only valid for parking of private motor vehicles at Lee Garden One, Lee Garden Two, Lee Garden Three, Hysan Place and Leighton carparks on the day of redemption. Hysan Marketing Services Ltd (including its managing agent) may require a customer to supply proof of identity or other items of personal information including but not limited to an individual's name, bank/credit card numbers or Octopus card numbers, for the purpose of processing the free parking privilege and to verify the customer's eligibility or the validity or authenticity of the spending receipts and/or for internal administration and auditing purposes. If the customer refuses to supply the relevant information, Hysan Marketing Services Ltd is not obliged to process the free parking and free valet parking privileges. Free parking and free valet parking privileges can only be redeemed once per customer per vehicle per day. All free parking and free valet parking redemptions are restricted to shoppers in-person. The free parking and free valet parking privileges cannot be exchanged for cash or set off and cannot be used in conjunction with other car park promotion offers. The free parking and free valet parking privileges are subject to carpark space availability and is not valid for the purpose of loading / unloading. 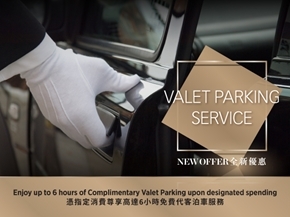 To enjoy valet parking privileges, all cars must be driven to Hysan Avenue (outside the shopping mall entrance of Lee Garden One) between 12:00noon and 11:00pm on Fridays to Sundays and Public Holidays. 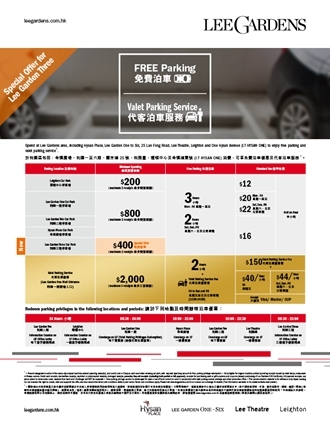 The free valet parking privileges are calculated based on the actual time the customer hands over their vehicle to the valet team at Hysan Avenue. Valet parking terms and conditions apply for users of valet parking privileges. Please click here for detailed Terms and Conditions for Valet Parking Services. Hysan Marketing Services Ltd. reserves the absolute right to change or amend any of the above Terms and Conditions, to change, extend, cancel or withdraw any of the free parking privileges and the promotion period of this offer at any time without prior notice and without incurring liability to any party whatsoever. Hysan Marketing Services Ltd. has the right of final decision in case of dispute. 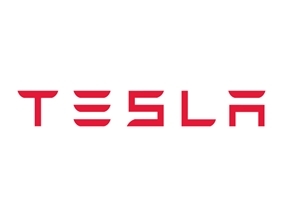 Two Tesla Superchargers are in service on the B3 Floor of Lee Garden One Car Park, allowing the Tesla owners to replenish half a charge to their Model S in as little as 20 minutes. For details, please contact our Concierge Counter. 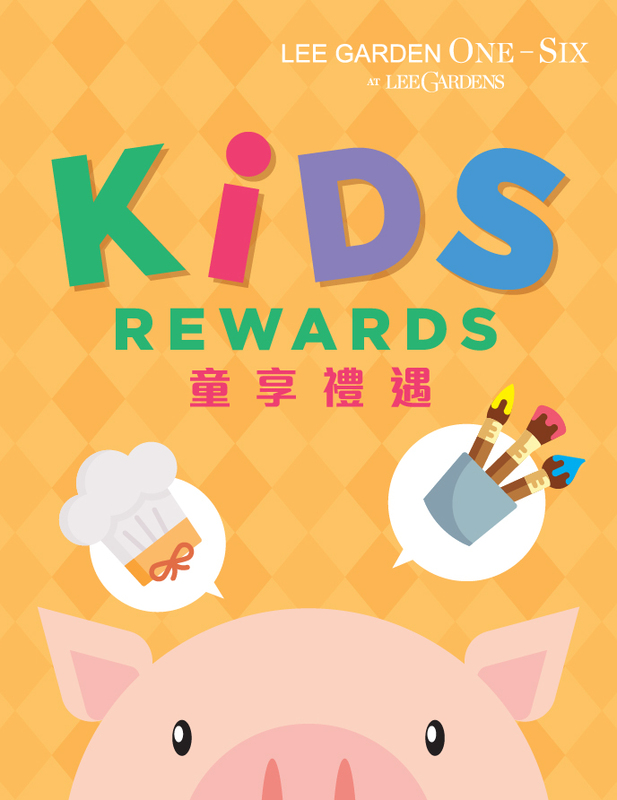 Spend designated amount on every Monday to Thursday (excluding public holidays), including an original machine-printed receipt of HK$500 or more issued by a restaurant at Lee Gardens Area and its matching electronic payment sales slip, to receive an additional 1-hour free parking coupon** ! Specific terms and conditions apply. Please click here for more details.